The water is one of the most important natural resources. People were striving for gaining access to fresh drinking water since Ancient times. However, transferring water to the cities was difficult, especially when they were located in a plain. To overcome this problem the Romans came to one of the most spectacular achievements in the field of engineering – the aqueducts. These were the most expensive public facilities built during the time of the Roman Empire. The Ancient city was supplied with fresh drinking water from the Rhodope Mountains. The two main water captations were found near the present day villages of Kuklen and Markovo. So far during the archaeological excavations the existence of two aqueducts and a clay water conduit are determined. Their hypothetical routes are localized. One of the aqueducts was about 6 km long. Different in size, its foundations were built on wooden columns stuck into the ground - piers. The aqueduct of Philippopol was built in II – III century. It comprises of the two main pipelines which beat off the mountain springs at the foot of the Rhodope mountain and join near the Komatevo neighborhood. There was found a massive construction of crushed stone. From the Komatevo neighborhood to the Youths hill two parallel aqueducts were directed which were passing by the slopes of the Youths hill, Bunardzik hill and Sahat hill and the gradient was towards Taksim hill. It was the place where the mountain waters get together following their way to different parts of the city. In the II century Philippopol already had a built pipeline network, which supplied it with approximately 480 liters per second or 43 000 tons of water annually. More impressive is the preserved Western aqueduct. 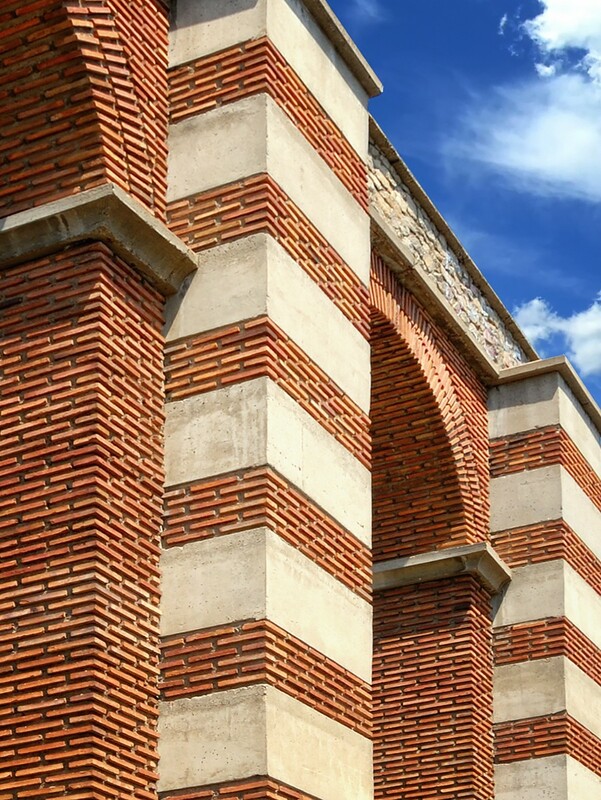 This facility, restored and presented to the public, welcomes all visitors of Plovdiv who approach the city from the West. It is fascinating how this impressive facility was built. The bases of the pillars are constructed as a continuous masonry wall with a width of 4.40 m. The typical Roman manner of masonry construction was used for the rest of the structure - square stone blocks arranged in lines are followed by rows of bricks. This construction technique is called opus mixtum, or mixed masonry. The ruins of the foundations that are exhibited in the new Presentation Centre of the Ancient Stadium were probably parts of the aqueduct. Not many cities in Europe had aqueducts. They were expensive and difficult for construction equipment which only the rich and important cities were able to afford. Parts of aqueducts can still be seen in Rome. And the ruins of the longest and best preserved Roman aqueduct can be seen in France, near the town of Nimes - the Bridge over the river Gard (Pont du Gard). These expensive engineering structures which supplied the city of Philippopolis with water are another confirmation of its importance in the Antiquity.